WHAT better way to illuminate the 2018 Warrandyte Festival theme, “Streets of our Town”, than by taking a walk down memory lane with this year’s honorary parade monarchs, Mel and Isaac McMullen? 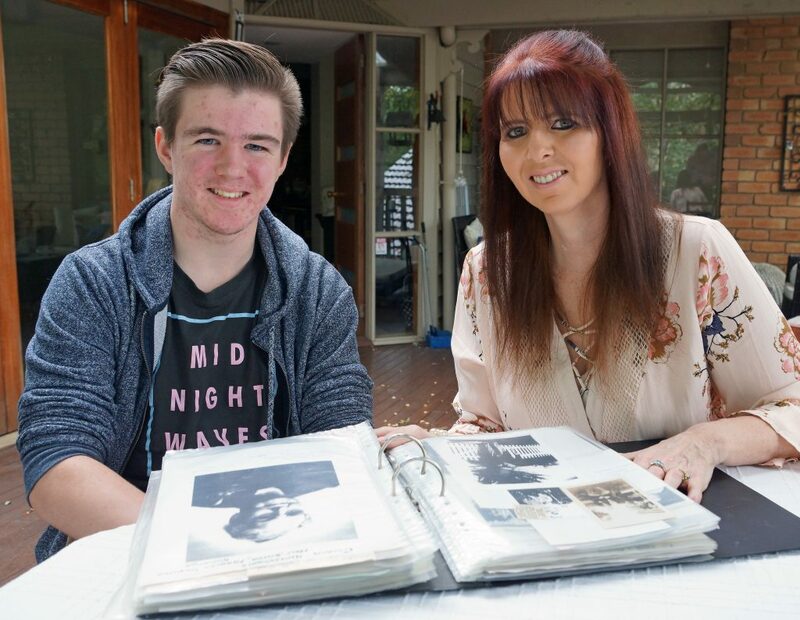 Married to Peter and mother of four sons, (Isaac being the youngest) Mel McMullen looks back with love at the Warrandyte she grew up in, shining a light on her connection to several prominent Warrandyte families. Taking a trip down Yarra Street, past the site of the old wood mill, cricket club, Trezise Street to the Grand Hotel and then a stroll over the bridge to “Tree Tops”, is to walk in the footsteps of my heritage. Our Warrandyte roots are unique and span over many generations, families and recognisable names in the community, still to this day, including links to the Grand Hotel, local churches, the art community, cricket club and local business. Miss Gwen Reeves, who lived in “Tree Tops” which still stands, was my great aunt and Isaac’s great, great aunt. Gwen, an eccentric lady who lived life to the full during her 97 years, would often be seen driving up and down the hills of Warrandyte in her blue Volkswagen Beetle. She was a direct relative to the Hemsworth family, to John, who was affectionately known as Fred. My grandfather and my father built “Tree Tops” on the land that Fred owned. John (Frederick) and Caroline Hemsworth married and had five children: William, Dorothea, Frances, Alice and Charley. My great grandma was Frances Hemsworth. The Hemsworth and Trezise families became linked by marriage. In 1908, The Grand Hotel was bought by Francis Trezise and held by the Trezise family until the 1960s. After the fires of 1939 that greatly affected Warrandyte, many family members moved out of the area because of property loss. In the 1962 fires, more homes were lost in the Hemsworth and Trezise families and more of them moved away because of the grief of their loss. My great aunt’s home was one of the only ones left standing. She sat on the roof of her home defending it until the remaining fire crew pretty much pulled her to safety in the back of the last engine over the bridge. She thought she had lost her home but was actually witnessing the loss of the Hemsworth homes and those of other neighbours. Gwen was a teacher of the deaf, and in her training she saw the potential to give deaf children a voice and the chance to be heard, (which was not a popular thought back in those days). Growing up, I heard passion in her conversations and the relentless retelling of stories about her students and theories as how to better their lives. Her concepts were foreign to me, as a youngster, when I had no understanding of how a deaf life could impact a child’s existence. On a hot Christmas Eve in 2002, Isaac, my youngest son at seven months old, was diagnosed profoundly deaf. It was a moment that would change our lives forever. All that Gwen had studied and lived for would be needed in her own family. Her theories, tried and tested, would now be implemented on one of her own. It was a diagnosis that would tie the family together in an intriguing way. Isaac was implanted with a cochlear implant and taught to hear and listen. Gwen’s life’s work had come full circle. The sounds she adored in Warrandyte, different birdcalls, the river flowing past her home, all would be sounds we would teach Isaac to hear. Gwen passed away leaving with us her voice for the deaf and the gift of appreciating sound — and especially for appreciating the surroundings we live in. Today, like my relatives did, we walk by the Yarra River with our dogs. All of my sons love the Parma at the Grand! We enjoy coffee at all the wonderful cafes in Yarra Street, we shop at IGA, go to the vets with our pets. We visit the local church, buy local produce at Aumanns, purchase gifts from the market and attend local schools. Most importantly, we still hear the same sounds my family did all those years ago. We live in and love these streets of Warrandyte — they house the stories of my childhood. I’m proud to pass down this heritage to my children who, today, experience all that Warrandyte has to offer and who also call these same streets “home”.